Internet gambling and super-casinos will cause an explosion in gambling addiction, doctors say. The British Medical Association's annual conference called for research into prevention and treatment to cope with the increasing problem. They said in recent years it had become easier to gamble. But they added there was little support in place to help sufferers as it was considered a "Cinderella addiction" behind drugs and alcohol. Doctors said the national lottery had made gambling socially acceptable, while the internet meant it was available 24/7. The industry is now worth £40bn a year, but is set to grow under government plans to establish a Las Vegas-style super-casino. Eight cities have been short-listed for the casino, but another 16 licences have also been granted for smaller casinos. It comes after the number of people addicted to gambling has been rising with up to 350,000 in the UK estimated to be addicts. Dr Jan Wise, a consultant psychiatrist from London, said there was a real concern children were becoming hooked. 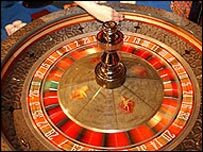 Latest figures suggest three quarters of 12 to 15-year-olds have played slot machines with 5% showing signs of gambling addiction. Dr Wise said: "This problem is going to get worse and we need to look at how we can treat people as well as trying to prevent them. "GPs tend not to refer people for treatment as there are perceived to be much more serious mental health and addiction problems so at the moment people rely on the voluntary sector. "If we don't get a grip on this it will become a real problem." Dr David Sinclair, from Fife, said the image of gambling as fun and safe masked the "dark side" of addiction. Dr Vivienne Nathanson, head of science and ethics at the British Medical Association, added GPs had already reported seeing more people with gambling addictions. "We need to have a look at what the impact of this is and what doctors can do in regards to referring people for psychological treatments and lobbying government. "If it gets out of control it can tear families apart and cause a whole host of mental and physical problems." The Belfast conference agreed a review should be carried out by BMA officials to look in to the impact of gambling and how it can be treated and prevented.